A rich kingdom built upon lush greenery and water. After slaying Mediuth with the divine Falchion sword, the hero Anri founded this land. Ever since, the successors of Anri’s bloodline have been the rulers, passing down the Falchion to the next generations. Aritia is also home to an elite knights squadron. A newly established island country surrounded by the azure seas. without even its own knights. Not long ago, there was a tribal conflict, which was resolved with the unification of the island and the kingdom’s formation. King Cartas of Akaneia, declared his younger brother, Count Marlon to be its king. 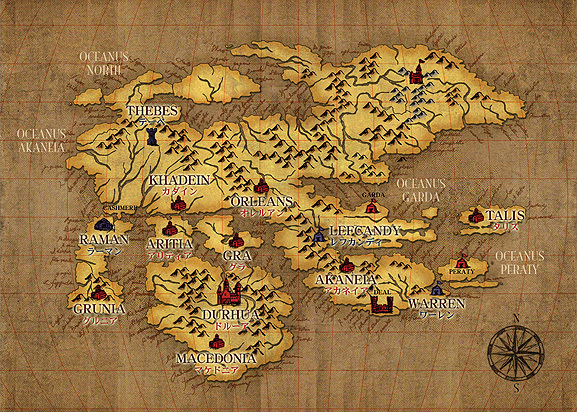 Since its formation, the country has always shared close ties with the Holy Kingdom of Akaneia. but in recent years many of its countries have gone independent. However it is still respected as the suzerain state. passed away, there was a division amongst the populace and eventually part of Aritia left to become independent, and so Gra was formed. Since the time of its formation, Gra had always been allied to Aritia. from his teachings, this free-governing city was born, ruled by its archbishop and countless high priests. After the liberation wars ended 100 years ago, the garrison leader General Ohdwin formed this knights country. Backed up by its powerful Black Knights and military might, Grunia subdued the neighbouring tribes and became one of the strongest countries in the continent. The land of wyverns and pegasi. Long ago, during the Durhua Empire’s reign, this land was were slaves were sent to. After Durhua’s fall, the slaves formed their own country and named Iote, a hero who fought to liberate the slaves, their first king. Afterwards, Macedonia was feared for its mighty Dragon Knights.